Amid nature, charming,romantic,fun! boats,2 docks,fireplace, SWest view,sunsets! This 'jewel house' has the best Maine has to offer: unprecedented tranquility & privacy with quaint,traditional New England charm, perched on the edge of pristine Knickerbocker Lake + many boats included, free! Conveniently located 2 mi from town & bustling harbor.Relax on ample docks to sights & sounds of wind on the water, loons,bull frogs and peepers calling! Cozy, inviting, warm & peaceful,many couples honeymooned here! Interior is knotty pine walls,pine floors,throw rugs & charming,homey touches.This gem has S & W exposure allowing for spectacular sunny days & sunsets!On dock relax in teak furniture,watch surrounding nature.A great family spot to read,play board games, rest & reconnect. Ideal for swimming,sunbathing, fishing,boating & pure r & r, you'll have a vacation you'll fondly remember & cherish.Spring,Summer & Fall each offer wonderful differences at this terrific location!Thank you for your interest in our beloved cottage.It's been in our family for years & we are pleased to extend our 2nd home to you! It's your own private hide-away! No buildings can be seen across the lake to dispel the serenity or view-- just trees! Furniture & beds are in good condition. Interior has a very cozy, inviting atmosphere that speaks to it being a home that is adored & well equipped. The bunk room is a favorite sunny afternoon spot, also perfect for napping! Rejuvenate here to the sight & sounds of wind on the water & loons calling.Grill outside & dine lakeside on the picnic table or dock! Since there is virtually NO ambient light or air pollution (no street lights), when it's clear, the night sky is spectacular, stars & planets are vivid & bold! In fact, shooting stars are frequently visible & you will be amazed at the brilliance of the heavens from this secret location!Ideal for swimming, sunbathing, fishing, canoeing, kayaking & pure relaxation, you'll have a vacation you'll fondly remember & cherish. Many have made repeat stays, allowing us to watch children grow up.It's all right here! Just watching the water & light changing on the canvas of the treeline will capture the essence of this vacation. Enjoy swimming & laying in the sun alongside a clear lake with clean shore! Wade in or jump off the dock! Our docks & charcoal grill set the stage for many great meals outside.This will likely be where you'll want to spend hours watching loons, ducks, herons, fish & dragonflies,stars, chatting, reading & dozing.Binoculars are provided.Paddle & explore the twin lakes by canoe or kayak: there's much to explore by boat,eye & foot. Blankets & pillows provided; sheets & towels available for rent if you choose not to bring your own. 50% of rental rate due upon time of booking secures your time & is non refundable. Owners traveling with dog(s): daily fee is charged for small-med well mannered & owner approved dog(s). Sorry, no other critters. An extra nightly fee will be charged for more than 2 adults &/or 2 children under age 12. Extra adult(s) must be approved by Owner. Once here, there are so many things you could do! Such as.... Boating: The harbor offers guided powerboat excursions in 2 or 3 hour versions, tour on a working lobster boat with a local lobsterman as your guide and captain! Among our favorite trips are the sailing schooners! These majestic beauties are a wonder to ride upon & appreciate under full sail.Day time & sunset sailing trips are offered. Find them all on between Pier 1-8 in the harbor near Fisherman's Wharf. Boothbay Region Land Trust (bbrlt.org): Generously donated land, these 21preserves provide over 50 miles of hiking trails open year round, free of charge. Enjoy short or long hikes varying from 1/2 mi to 3 miles along any of the trails which boasts 4,000+ acres. Preserves cover over 1,800 acres including six islands protecting wildlife habitat; vistas, forests, meadows, wetlands, shore front, & historical sites.Wherever feasible & ecologically wise, BRLT provides opportunities for public access. Take in live & stage theater + concerts at the Carousel Dinner Theater, The Opera House, & our Harbor Movie Cinema. Don't miss the Maine State Aquarium on McKown Point filled with great information & live local sea critters -including a touching tank with crabs,periwinkles,starfish & sand sharks. The Boothbay Railway Village,Train & Antique Auto Museum is a local favorite for kids, families & auto enthusiasts! Ride the antique railway village steam train & see the train museum. Auto enthusiasts will be impressed by the diverse collection of antique autos--Packard's to Rolls Royce cars,trucks,fire engines & even motorcycles-- fill this noteworthy museum with 70+ magnificent vehicles. Drive out to walk the ledges at Ocean Point & Grimes Cove beach in East Boothbay:From Rt 27, the only traffic light in town, take Rt 96, 8 miles until it dead ends at the Atlantic Ocean. Also, drive out to Hendrick's Head beach and lighthouse on Southport Island. Head to Rt 1 and see the sights! Rt 1 starts 'downeast' & ends in Key West! Rainy day?Check out our library! Also, we're just over 1 mile from the YMCA on Rt. 27 S as you head towards town. Many say this is one of the best YMCA’s in the country! Aquatic Center has just been completely rebuilt (2012) including 2 beautiful pools. Indoor fitness center is enormous;courts for indoor tennis,racquetball,basketball. Day and week passes available. Dining: Coastal Maine is famous for lobster which is prepared in many delicious, creative dishes- or traditionally steamed & savored with melted butter. It's possible to buy them right at the lobsterman's co-op on the docks down town, bring them home cooked by them, or live for you to cook yourself! Don't skip locally harvested clams & oysters- - locally cultivated (& shipped all over world) especially those from the Damariscotta River.Or join a boat excursion to Cabbage Island for an authentic lobster & clam bake! Restaurant's that we frequent and enjoy include: Brown Brother's (on Atlantic Ave, East side of the harbor), Thistle Inn (Oak St), McSeagulls (on Pier One,live music), Dunton's Doghouse (Sea St), The Ice Cream Parlor (on Pier One) Robinson's Wharf and Pub (on Southport Island, just over the bridge).Good pizza: Village House of Pizza, across from Hannaford. In Damariscotta we haunt King Eider's Pub:Great crab cakes, but everything is very good.Hit Route One North & head for Moody's Diner in Waldoboro for classic good food all day & night. Boothbay also offers other cuisine: authentic Italian (chef summers here but is from Italy) Italian, Vietnamese, Chinese, tapas, traditional American and even a few good pizza joints! Bars serve locally brewed beers, great chowders, fresh fish in a variety of ways. There's a harbor front oyster bar with locally harvested oysters known to be some of the best in the world, according to many chefs & connoisseurs. Many local eateries often host local musical talent and bands which can be heard on week-ends. Oak Street Provision's: butcher, seafood mkt, vast wine, beer & coffee stock! Local Farmer's Market held every Thursday: Fresh fruit,veggies,seafood, mushrooms,cheeses,breads, flowers, honey, preserves & more sold only from 9 -noon on the Common Green in Boothbay Center. Fresh bakery! Baker's Way make wonderful donuts & apple fritters 'to die for' are fresh daily at Baker's Way, at 94 Townsend Ave. They also serve authentic Vietnamese meals all day and evening. MAY: Memorial Day Arts & Crafts Show. JUNE: Lobster Boat Races;Strawberry Festival,Owl's Head Airplane Museum Days;Windjammer Days. JULY: Antique Engines @ Railway Village; 4 Celebration! ; 3rd wk-end Antique Auto Days;Jazz Weekend. AUGUST: Boat Builders Festival;Rotary Auction;Shipyard (yacht sailing race) Cup;Arts& Crafts Festival;Children's Festival. I consider Maine home since the majority of my life has been spent on the Boothbay peninsula. Having moved back here after college & corporate careers, I now have my own home & businesshere (lic.massage therapist + ElectroMagneticTherapy & health coach), just a few miles from the cottage. Our beloved West Highland Terrier is my white shadow & great ambassador! When I am not working, I can usually be found in a garden! I thoroughly enjoy being outside, often tending our vegetable, flower & perennial gardens with our Westie at my side! My mother, the owner of this charming property, worked as an R.N. while raising me as a single parent. Her love & hard work enabled her to keep this second home. As such, we have been able to use and appreciate this home in all seasons for many years! I have memories of shoveling off a big area on the frozen lake,then a hole was drilled by auger,water was pumped up to flood the 'ring' and freeze smooth.We had the great skating parties! Of course, a bonfire was lit for warmth and festivity, marshmallows and more were toasted on the fire!! I also grew up water skiing on the lake! Mom taught many friends how to water ski and put on quite am impressive show herself (a natural athlete!). Skiing here is long gone since laws changed and motors are restricted to 5 hp for fishing/trolling,but many years of happy times built great memories for us both. This is a very special place. We have maintained, managed and enjoyed this home and property together now for many years. I act as the manager for the cottage. We are obviously familiar with the region and are happy to be of assistance with ideas and recommendations. Plus, I live 'just down the road' and can/will help if you need it while you are here at the cottage! Come see for yourselves how lovely & enjoyable it is here, & why guests who have stayed with us rave about it! I am confident believe you'll be glad you did and will do my best to ensure it! We want happy guests! Please call Kim to book: 207 837 0604. 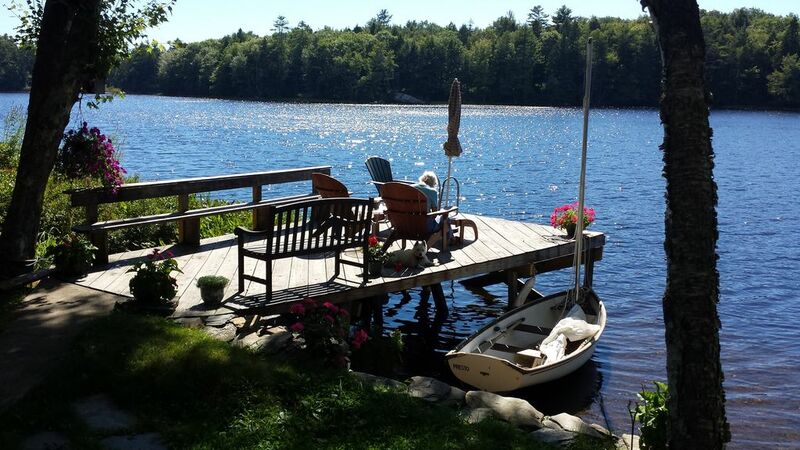 While here on Boothbay's Knickerbocker Lake you will be immersed in nature and privacy. A small stream carries winter snow melt & rain off the ridge & into the lake. Nestled among towering pines & oaks, there is wonderful south & western sunset exposure from late morning 'til sunset. You will see and hear more wild life than people on the lake.Take our canoe or 3 kayaks and paddle the perimeter, even explore the second 'Little' Knickerbocker Lake! While enjoying the water from home or dock, you will gaze across the lake towards an unblemished waterfront--no development in sight! And neighbors are rarely seen....this location really is a well kept secret with minimal use, thankfully! Our cottage has 2 wooden docks: 14' x 20', wide fixed dock (on posts) for sturdiness and safety & a smaller surface dock for swimming and boat use/easy access. We keep teak Adirondack chairs with foot hassocks on the dock, small tables and a bench for plenty of seating options. Bring your pole & feel free to cast a fishing line; the lake is stocked with large mouth bass and lake trout by the local Fish & Game Club. Inside we have comfortable seating in the living room with two couches, rocking chair & large picture window that provides a better view than any big screen TV! Enjoy a real wood fire in our fire place to set a relaxing mood &/or take the chill off. The home is equipped with gas heat as well so you will certainly be comfortable and warm in any season. This is a delightful gem and much adored home that is clean, very well equipped, and comfortable. We are happy to greet you, make sure you are settled in and help with suggestions of local interests. We know the region and can suggest restaurants, day trips and tucked away places easily missed, unless you get 'a local' to tell you! We have years of knowledge of the area and live just a few miles close by. Please come see why so many of our guests raved about their vacation at our cottage! A window at eye level provides natural light, views to the south & lake, & fresh air without compromising privacy! Great water pressure in shower stall. We & many other guests, have enjoyed the spectacular hydro-therapeutic effect of this great shower with remarkable water pressure & hot water! There is a standard toilet & small sink as well, but please know that this is a small yet functional room. Clean water is a precious resource. Please be 'green' and conscientious of our planet's resource wherever you may travel! Our cottage is merely 5 minutes, less than 3 miles from the "harbor"! Driving a few miles further will take you to small sandy Atlantic beaches (Barrett Park, Grime's Cove, Hendrick's Head beach)! The Boothbay peninsula is a popular resort community with fascinating history, natural raw beauty and a wide variety of options for pleasure and holiday fun. Privacy at our cottage is assured in this setting 2 miles from town & hustle-bustle. Whether relaxing in this quaint cottage or outside- lake or dock side- you will long remember this tranquil haven. Every room in our cottage has a view onto the lake, which is literally just a few yards away! Serene water scenes, surrounded by trees & sky, will do wonders for your spirit and soul.Star gazing also! This cean, clear spring fed lake makes for thoroughly enjoyable and refreshing swimming and boating. Quiet and virtually all private property border the lake so it is like your own peaceful hide away. So far, most all cell phone providers are accessible from inside the home & on the dock outside. No land line, internet or cable tv-- on purpose!! Great time & place to UNplug- & recharge naturally! Optional. But plenty of pillows and blankets. Original brick chimney and wood burning fireplace made of locally crafted bricks over 70 years ago. Great for indoor ambiance, warmth and s'mores! Single car space just a few yards from the back door of the cottage. We suggest that you back into the driveway from the upper lawn area and to park. This will greatly simplify exit by day or night. Two comfortable couches, as well as a rocking chair. Floor lamp & coffee table as well. Large glass picture window looks onto the lake & wilderness shore opposite and NO development in sight! Lovely! Full size, double doors with a full size capacity (plus top freezer design, ice trays and ice cube box. I'll have fresh ice cubes waiting for you in the freezer upon your arrival! Yes, with 4 burners and oven, all in one appliance. Modern electric oven and 4 burner stove-top combination appliance. Yes, we have one here and it works great if you are inclined to use microwave ovens. Interior glass turn plate rotates when under power. Either 4 or 8 cup, automatic drip style. An adorable tea kettle is also in the home. We do not supply the coffee, however there are teabags and a sweet tea pot! Two slice model! A counter-top toaster oven is likely to be in the kitchen also. Likely to find a bit of flour, sugar, plastic food storage containers, foil, maybe plastic wrap - though we are loathe to use it (our planet is getting ruined! ).Basic spices, might be some condiments. Handsome dishes (large and small plates, bowls), glassware, flatware service for 12, coffee/tea mugs, wine & beer glasses, plastic cups, multiple cutlery knives, cooking utensils of all needs & uses! Cozy dinette table for 2 -or a third, little person- in kitchen. Dinette table expands (sides pop up)& can be easily moved into LR to seat 4 + ;Outside, the large picnic table beside the lake seats 8. Good quality Panasonic 21' color TV with rooftop antennae for 5 basic channels! We do have it connected to a DVD/VHS player. In my opinion, this whole set up ought not even be there, but...it is, & we keep it real basic, simple for a reason! Many DVD & VHS movies are at the cottage. Bose! Excellent quality am/fm stereo system in the home for your enjoyment as well! Yes, as well as VHS player (imagine! ), all in one unit. Connected to the 21" TV. This is all set up in the living room. We provide about 12 family friendly movies for each system. Many books, and a vast variety of subjects including several for children. Please enjoy them while being our guest, and be sure to leave them before you go home! Many board games and puzzles, cards & cribbage as well. Scrabble, Dominoes, Parchesi, Rumicube, Battleship, Candyland, Yahtzee, Chess, Checkers, jigsaw puzzles to name a few! Available upon request. Music CDs may or may not be provided. Unfortunately, many have "walked away" & music is personal.Most people seem to use their electronics as a music source these days anyway. of sorts...stuffed animals, educational items, mind challengers, plenty to do and enjoy while here! We provide about 20 DVD & VHS movies and there is a DVD/VHS player machine connected to a 21' color TV in the living room. We trust that these movies stay at the cottage. Please enjoy them while our guest and be sure to leave them before you go home! New LLBean tandem kayak + 2 single fresh water kayaks are provided for your enjoyment, as well as 16' wide bellied aluminum Grumman canoe! Paddles, oars, life vests in child -- adult sizes are here! Large Grumman white-water canoe and two single plus one tandem kayaks are provided with the home; paddles and life vests also. LARGE dock & picnic table, separated from the cottage by a short set of stairs and six feet of land. The dock is 10' by 18' on fixed posts set into the lake, with ladder & shore access to the water. Plan on spending time here--eating, drinking, relaxing, dozing....You'll understand once you get here. Two non-penetrable rubberized body length floating water rafts are a GREAT way to relax in the water. Swim noodles and body boards are also provided. NICE! Free local courts behind the high school. Indoor tennis courts are also available for a small fee at our fabulous recently fully remodeled YMCA, just 2 miles from the cottage. No, this is not a safe place for wheelchair user/use! The solid walkway into the rear of the home, from the driveway, is sloped down a moderately steep hill. On the lakeside/ front of the house there is a wide staircase which leads to the lake, picnic table, fire-pit and two docks: a large fixed post wood dock 8' x 14' & floating surface dock 4' x 8.' The staircase leading in/out from the water-side of the cottage is flanked with railings and handrails on both sides. Stay at our peaceful lakeside retreat for relaxation & day-tripping. You'll have a vacation you'll truly enjoy, remember & treasure.No extra charge for 4 boats! Great romantic get-away &/or fun for a family. Many couples have honeymooned here & families return often.Very private, quiet, & 'away from it all' yet only 3 miles to reach the bustling Harbor downtown. So peaceful it's like yr own private lake-really. Board games,puzzles, DVDs, fireplace & reading library. teak Adirondack chairs+ hassocks, swimming rafts & toys.Lovely SW exposure & sunsets! Enjoy charcoal grilling, make s'mores & dine lakeside on picnic table or dock.Wade in or jump off either the floating or fixed dock for refreshing, clean swimming. Outdoor fire pit! Peaceful, black star filled nights are amazing w/ no ambient lights.Enjoy a moonlit paddle around the twin lakes, cast a line for bass & trout fishing.Bring sweaters, fishing gear & swim suits; leave stress and hectic electronics behind.Sm-med dogs considered! This little gem of a waterfront home has south & west exposure allowing for spectacular sun drenched days & soothing sunsets. The opposite shore is wild and undeveloped; only one home can be seen amid the forest, 100' back from the lake. Neighboring houses beside our own are infrequently used. There is little to interrupt the serenity or view here--just critters and trees. It's your own private hide-away! Relax on this expansive dock our beside the fire to sights & sounds of wind on the water & loons calling. Romantic & peaceful, with a working fireplace, many couples have honeymooned here. There is one cozy bedroom with a full sized bed and two windows that view west, over looking the docks lake. A second bedroom is the bunk room, with twin size bunk beds. This room, once a porch, is also a favorite sunny afternoon spot, perfect for reading or napping. From the bunk room is a glass paned door, leading down 10 steps to the lawn, dock and lakefront just 15' from the home. Walk out onto the spacious 12' x 18' newly rebuilt dock & relax in teak furniture: Adirondack chairs with foot rests, loveseat or long bench seat! A surface water level dock (adjacent to higher post and beam fixed dock) makes for easy access into canoe and kayaks. Grill outside with charcoal & dine lakeside on picnic table or dock.Since their is virtually NO ambient light/air pollution (no street lights, low traffic and 200' from the road), when it's clear,the night sky is spectacular, stars & planets are vivid & bold! Shooting stars are frequently visible; you will be amazed at the brilliance of the heavens from this secret location!A great family spot to read,play board games, rest & reconnect.Ideal for swimming, fishing, boating & pure R & R. Bring your poles and tackle box; the lake boasts large mouth bass and rainbow trout; it is stocked each spring by local Fish & Game club. Knickerbocker Lakes (2!) are spring fed: clean, clear water! Hundreds of cool 'pockets' can be felt while swimming...the water is refreshing and silky smooth. Other Activities: We provide at no extra cost the use of for boats:canoe & 2 single kayaks. All necessary paddles & life jackets in all sizes also provided.Also for your use are swim noodles,body boards. Horse shoes & a set for badminton are also at the cottage. Inside activities include an abundance of board games: Parcheesi, Monopoly,Battleship,Trivial Pursuit, Candyland, Chutes and Ladders,Uno,Yahtzee, jig saw puzzles,cards,cribbage board,chess/checkers. We are a family of readers so there are many books! I've created a diverse library of books and dvds for the cottage so there is a variety of subject matter, not just novels....children's books as well. Basic TV only, with DVD / VHS player with a number of movies provided. We are happy to be "unplugged" from wifi and cable tv here! 18 hole golf course welcomes all. Impressive, scenic newly renovated course (Boothbay Country Club) is under new ownership (2014) with a beautiful, challenging back 9 & driving range. All skill levels will enjoy this course. Miniature golf location is only 2 miles from our cottage. In fact, it is a championship course and the owner is the former New England Miniature Golf Champion! Both daytime and evening by lights open for playing. Creative and challenging, this course is fun for all ages. When was the last time you played? Photo opportunity! Also at this location you'll find locally made ice cream available (cones, shakes, sundaes, etc.) and a reconstructed covered bridge hosting a museum of sea shells and more. Also: Bath (S on Rt 1, 30 miles) has an 18 hole public course.Great course@ Sebasco Resort in Rockland (N on Rt 1, 50 miles). Our cottage is a great excursion point from which to enjoy day trips all around the mid-coast area: Pemeqiud Lighthouse, Damariscotta, Camden, Rockland, Monheagan + Vinal Haven, Islands, Portland, Kennebunkport, Oqunquit Beach,even the mountain district!Come see & explore! See the harbor area by boat! Numerous lg & sm sail & power boats,even kayaks,leave from the downtown harbor for memorable tours. Over 4,000 acres in 18 Land Trust Nature Preserves offer 20+ hikes from .5 to 5 miles, along ocean, river & through pine filled fragrant forests. Coastal Maine Botanical Gardens are spectacular with 250 acres & salt water frontage, stone-scaping to impress everyone, fairy gardens,water gardens & more! Antique auto & railway museum hosts over 70 fabulous autos & authentic coal & steam train rides! Marine aquarium is educational resource for all plus a live touch tank with sea animals! Great restaurants, movie & stage theater,art galleries,studios & shops galore! So many options! Come stay & see why so many rave about our home! Simple rental lease, security damage deposit required, fees for cleaning, taxes, etc required of all guests. Three boats (canoe, kayaks) provided at no additional charge! FYI:That's a great value-added feature and wicked good deal, frankly! Extra charge per adult per night applies if more than 2 adults and 2 children under 12 years of age. (Just like any hotel would do.) There is, in fact, only bed space for 4 people..... Dogs under 25 lbs considered, modest daily pet fee per pet charged. PLEASE be sure to bring your own pet bedding. NO dogs allowed on ANY furniture. We all know that dog smells--especially if pet is damp-- on furniture is not pleasant.NO cats. Please pick up pet waste and dispose of either deep in the woods or in plastic bag and in the trash as apposed to flushing. Nominal fee applies per week per booking, for recycling and septic. Cancellation policy: The initial payment of 50% of the the amount rate is non-refundable. Cancelled reservations 30 days of prior to start of rental period is not refundable.